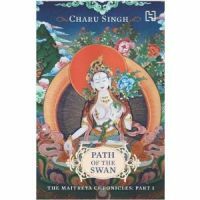 otherworldly beings that populate the myths of the Mahayan school of Buddhism, Part 1 of The Maitreya Chronicles is a surreal and mesmerizing account of the battle between the dark forces and the celestials and the descent of the celestials to Earth. Charu Singh grew up in Chandigarh and spent her holidays in Kathgarh, in her grandparents' fort in the Shivalik hills. The forests and fields surrounding the fort became her haunt for many adventures and exploration of local legends. She studied at the Punjab University in Chandigarh and after completing her education left for the North East where she worked as a freelance researcher for Unicef. She has since worked with The Asian Age, Frontline and Tribune. She is also a classical dancer, trained in Odissi and Kathak. She is deeply interested in the spiritual and has explored Buddhism and Hinduism as well as other religions. She has lived for a substantial time in India's north-east including Sikkim, Assam and Manipur and has also lived in Kashmir and Moscow. She is now based in New Delhi where she lives with her husband and son.